The best online storefronts in the industry. More and more customers are using the Internet to shop for goods and services, which means you've got to be online to succeed offline. A full-service e-commerce website that Teleflora builds, maintains, and markets throughout the year. Our industry-leading platform is recognized as the best in floral. Our sites are built on the same powerful Oracle technology as online retailers including Neiman Marcus, Best Buy, CVS, and Sephora. Now you can have the same eCommerce technology that powers their sites! 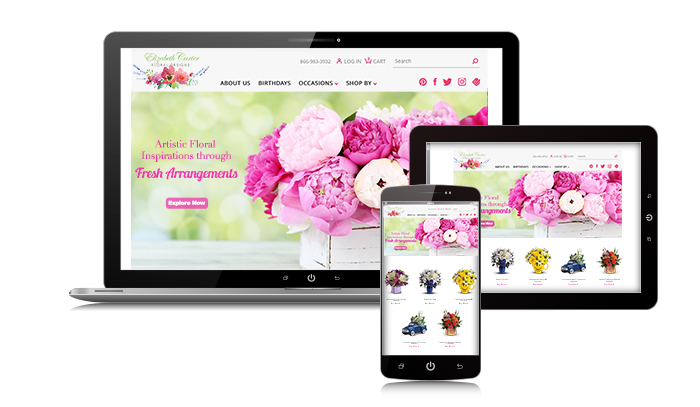 eFlorist delivers high conversion rates on all devices. As more shoppers use mobile than ever before, our fully responsive sites provide a great experience on mobile phones, tablets, and desktops. Marketing support at no additional cost. eFlorist members have access to a team of eMarketing Counselors who can provide guidance and tools for everything from SEO to social media. State-of-the-art security features to protect your customers and your business. Over 540 styles, themes and layout combinations to choose from, so you can create an online storefront that matches your shop. Click here to explore what your website could look like. Bilingual websites. With one click, visitors can translate your eFlorist site to French. Get your shop to the top with our Online Search Marketing Program (Available only in the US.) Click here to learn more. Convert browsers to customers with our Yelp premium listings. Click here to learn more. Accelerate your holiday business with our eMail Plus promotion program. Click here to learn more. Give your site SEO a boost and control your business listings with Search Optimizer by Yext. Click here to learn more. To enroll in the eFlorist Program™, fill out our online form or call 800.421.2815.